Gecko Guesthouse i Langkawi, Malaysia: Reservér nu! 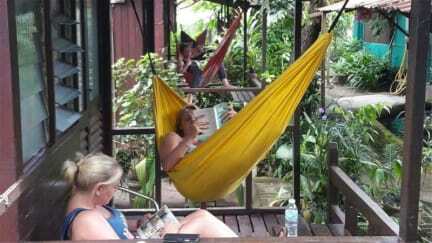 Gecko Guesthouse has been welcoming backpackers since 2003, We are one of the older and livelier guesthouses in Pantai Cenang and have an on-site bar open til midnight. Our location is excellent, just off the main road and 3 minutes walk to the beach and 10 minutes walk to Cenang Mall. Our best asset is the lovely tropical garden area where one can relax, read a book, play online or simply swap stories with fellow travelers and make new friends. We offer various types of accommodation to suit your budget from dormitory to air-con rooms and have double and twin rooms available. 5. Reception working hours 09:00-23:00.